Growing up in Grand Prairie, Randy Wyness was very active in all sports, particularly hockey and baseball. The family moved to Wetaskiwin in September of 1973. At age 15, in May 1974, Randy was dealt a hand which altered his life forever. He spent three months in the University of Alberta Hospital and Aberhart Rehabilitation Centre and another six years confronting the demons which are associated with life in a wheelchair. 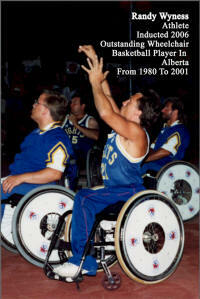 Randy began playing competitive wheelchair basketball in 1980 and excelled as a player in Alberta as well as in Canada. Randy played with the powerhouse Northern Lights for more than twenty years. 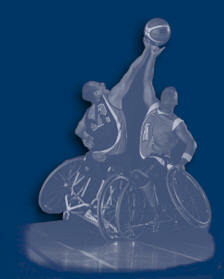 In that time he played in 14 NWBA Regional Championship Tournaments. His team placed as high as 4th out of 184 registered teams. During that twenty-plus year period Randy was also selected to play on Team Alberta sixteen times, winning won 8 gold, 5 Silver, and 2 Bronze place finishes. Team Alberta won a record 7 consecutive championships with Randy on the court. Another tribute to his basketball skills was his selections to play on Team Canada from 1983 through 1989. This team represented Canada at Worlds (Halifax) 1983, Paralympic Games (Ayslbury, England) 1984, Paralympic Games (Seoul, Korea) 1988 (via Australia). 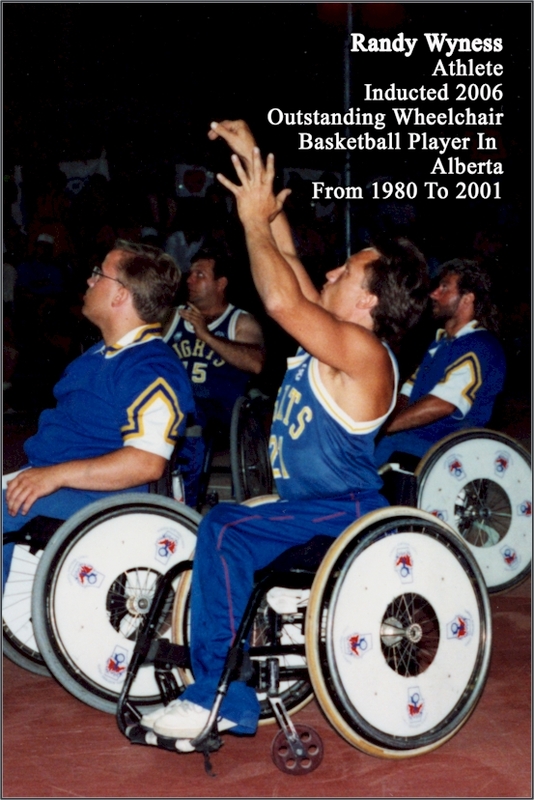 1987 - In skills‑testing conducted by Wheelchair Basketball Canada in Alberta and in Canada Randy was ranked as #1 Top Skilled in Alberta and #1 in Canada.